For the endorsement of Steve’s bishop, His Excellency Bishop Earl Boyea of Lansing, Michigan, click here. 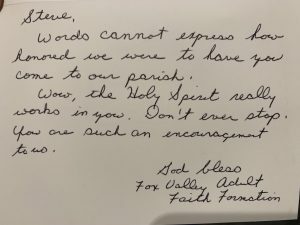 For the endorsement of Steve’s pastor, Fr. Ed Fride of Christ the King Parish in Ann Arbor, Michigan, click here. Thank you for coming to North Platte, Nebraska for our Parish Mission in April 2017. I appreciate all that you do much more than this very late thank you might indicate. I have been blessed to be with you on Pilgrimages. It was very good to welcome you to our Parish as you presented three talks during our Forty Hours Eucharistic Adoration. Your talks: From Baptist to Catholic; Defending the Eucharist; and Swimming Upstream were excellent, and were well received. We were blessed to have people come from as much as 100 miles away to hear you speak. A number of persons commented to me that they had heard you speak on CD’s or bVD’s, however the experience of hearing you speak in person is a much better thing. As you know, St. lrenaeus Parish in Rochester Hills has celebrated its 50th anniversary this past year. We had many special events in this celebration one of which was your presentation on the Early Church Fathers especially St. lrenaeus. The event was well attended and your enthusiasm and insights were appreciated by all. 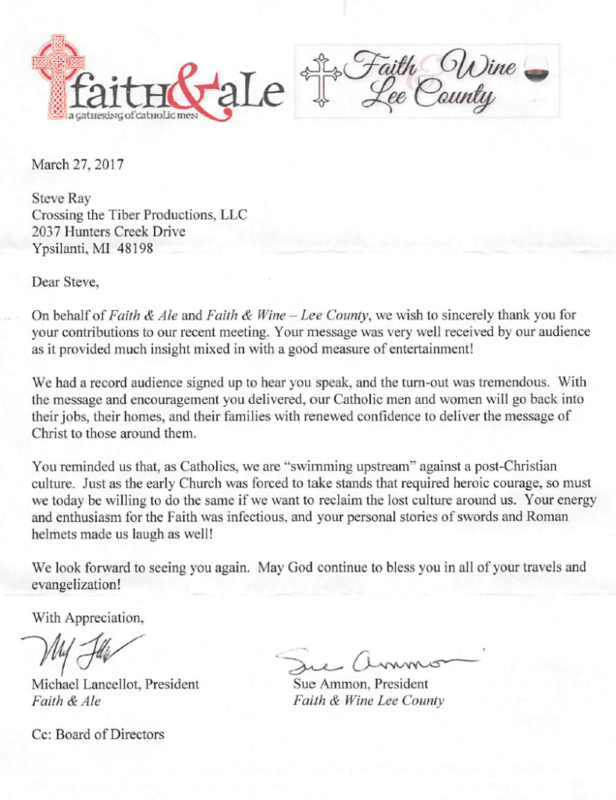 We had a discussion at our first Parish Council meeting following the event, and all agreed to extend a special thank you on behalf the Parish Council of St. lrenaeus, and Father Brian Chabala, for your time away from your family, the effort you put into customizing your talk for us, and the special consideration you gave our parish. Steve Ray is an inspired speaker with a charism for preaching. His love for the Lord, the Church and the Catholic faith shines through his words and actions. Steve’s talks on St. I can’t find words to tell you two how much we appreciated having you with us, both on a professional and a personal level. You touched so many by your witness and talks. In fact, the numbers attending our showing of your videos has grown, and it gives all who attend a change to continue having you “with us.” You are a very remarkable and loving couple, and all of us who spent time with you felt like we had known you for years. Thanks for coming, you make a difference. The men were spirit filled. I wish time had permitted you to be there for the closing Benediction of the Blessed Sacrament. What a powerful experience. My brother Deacon Jose Manuel, had the men come to the altar ,kneeling on the steps. He brought the Monstrance to each man personally. The degree of reverence was profound. From what you did, the Holy Spirit was able to enter their lives like never before. The experience will leave them hungry for more. Their parishes will sustain them until once again they will have an opportunity to summit the mount of transfiguration and be renewed once more. You have a gift my friend. You can touch the hearts of men where they are and invite them to become transformed into disciples and leaders for Christ. Of course, I’ll write you a letter of recommendation! I will also share our experience with our brothers in the Diocese of the Palm Beaches and with the Diocese of Orlando, who have men’s conferences as well. May God continue to bless you and your family. May He continue to bless your ministry abundantly. Steve Ray is an inspired speaker with a charism for preaching. His love for the Lord, the Church and the Catholic faith shines through his words and actions. Steve’s talks on St. Paul are a wonderful experience for all who attend and are a great way to promote and participate in the Pauline year. We thank him for coming to the Diocese of Corpus Christi. Words like dynamic, compelling, inspiring and insightful all come to mind when I think of describing Steve’s presentations. I say presentations, because they are more than just “talks”; he puts his whole heart into them. They not only provide intellectual information, they call you to a deeper and more profound understanding of Christ and His Church. No one I know has such zeal and desire to spread the Good News as does Steve Ray. There is an infectious joy in his delivery that speaks as clearly as the truths he proclaims. It is so easy to give his CD’s to non-Catholic friends and family, because he extends such a warm welcome to come to our beloved Faith. God bless you, Steve! Bill & I want to thank you for sharing with our Parish your love and dedication to the Catholic church, God and Jesus. All the people there that night fell in love with you. Father Andy, even preached to the school children the Friday after you were there about you and the strong faith you have. You are an inspiration to all. It was such a pleasure to meet you. the event was the best we’ve had all year. And, I’m being completely honest — I am not a sugar-coater. Thank you for fitting us into your very tight schedule. I am going to send around your website to our members because so many were interested in the tapes and books. Keep up the good work. I am a great fan of yours from way back in the Philippines where I saw and heard your talk on our local TV station. I’m very impressed with how you deliver your talks in such very simple manner where ordinary people could relate and understand. I guess you are filled with Holy Spirit everytime you speak as you have the gift to captivate your audience, full of energy and wisdom. I am always stuck in front of the TV watching you and you give me so much understanding in my faith. Last night I have the pleasure of hearing Catholic apologist Steve Ray speak at a local parish. Many of you know his story from the Ignatius Press book entitled Crossing the Tiber . . . For the whole two page review, click here or here. Oswald Sobrino, J.D., M.A., who has published in New Blackfriars (U.K.), Homiletic & Pastoral Review, The Catholic Answer, New Oxford Review, CatholicExchange.com, and the Fellowship of Catholic Scholars Quarterly. The standing ovation you received from our Legatus Club illustrated how much we appreciated your talk. We want to order ASAP, 30 audio CD’s of your conversion story and mail them to members who did not get to see you in person. Thanks! Just got back from your talk at the Legatus meeting, and you were fantastic!! Thanks for all you do for the Catholic faith. Your talks at Rockford’s Catholic conference were truly inspiring to many people, even to practicing Catholics. You have shown me how the Bible works wonderfully together with the teachings of the Church providing discipline and guidance in seeking the truth. Your explanations were lucid and crystal clear. I have become a stronger Catholic ever since. May God bless you a hundred fold in your mission and journey in life. The reason for this e-mail is to personally thank you for the impact you made on the life, soul and heart of my husband-to-be. I was raised in a Catholic environment, am a Catholic musician, go to Franciscan University of Steubenville, have been and always will be Catholic. After reading your book and seeing you speak quite a few years ago in Michigan, my beau had an experience he will never forget. To this day, when he watches a copy of the video taping of your talk he tears up and praises God. I love God, I love my beau and I love you for bringing him home to the Catholic Church in a more vibrant way. He gets it. He sees the truth. Thank you, thank you, thank you. I am praying for your ministry and may God Bless you in all you do! Guam has been fortunate to have the presence of Steve and Janet Ray, noted apologists, for the weekend of April 15-19, 2005. As the Ordinary for the Archdiocese of Agana (GUAM, USA’s westernmost territory–“where America’s day begins”), I am so grateful to them. We exposed them to as many of our (120,000) Catholic population (of our total 160,000 population) with presentations at the Dulce Nombre de Maria Cathedral-Basilica, where their talks were broadcast live simultaneously on our Catholic Educational Radio (90.9FM), at the University of Guam Field house on Sunday, April 17 where they addressed 2,500+ Catholics with a Mass celebrating the life of the late Pope John Paul II and in preparation for the Conclave of Cardinals (which eventually elected His Eminence Joseph Cardinal Ratzinger–who chose the name Pope Benedict XVI), then finally to a group of students from our Tri-Catholic High Schools (Father Duenas Memorial High School, Notre Dame High School and Academy of Our Lady of Guam High School). They encouraged our “sleeping giant” Catholics to wake up and march forth in defending and explaining the truths of the Catholic Church which has been preached and taught and lived faithfully since the very early days of the Church, preceding the Bible-olics of the 18th Century! They were truly a “breath of fresh air” so much needed in our Church and our world today. And so, we thank Steve and Janet Ray profusely for their help in making us see the beauty of our Catholic Church “ever ancient yet ever new! 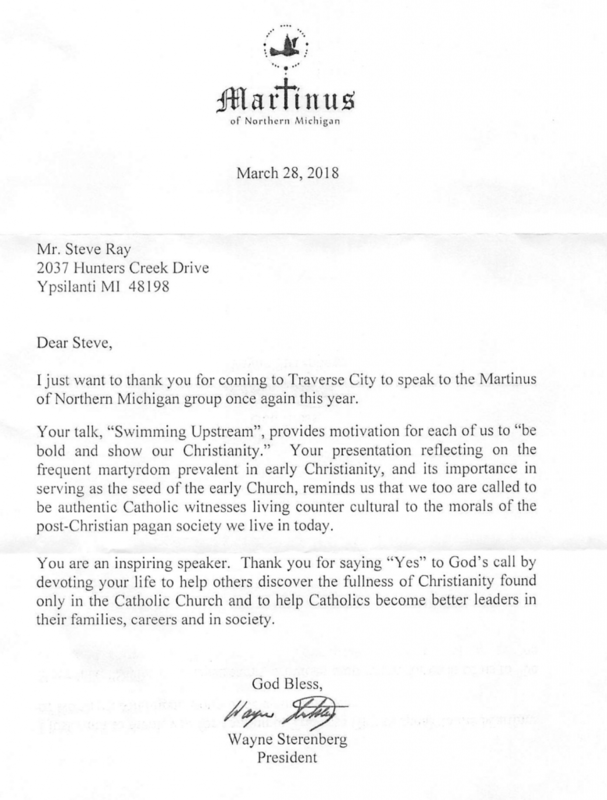 Dear Steve: As Chapter Coordinator for the Grand Rapids Legatus group, God blesses me with the task of interacting with some of the most remarkable and holy people that He has asked to speak for Him – modern day prophets! Meeting you and Janet last night was nothing but a pleasure and a privilege. In the two years that I have been working for Legatus, I have never had so many of the members ask to have a speaker signed on for an encore the next year. After our planning meeting next month, I am sure that I will be calling you on behalf of the Board to arrange to have you back to speak to us in 2008. -Very interesting speaker – would love to hear more. -Everything was perfect!!! Let’s get Steve Ray back again. -Excellent content and presentation. Interesting, important, relevant, VERY good! Melanie and I want to thank you, on behalf of the DFF and the Filipino people for all the good things you have done by your coming here. You are most generous not only with your money, but even more so with your time and desire to uplift our situation by teaching us what you have learned about our Faith! During your stay here, as in the past years, you have always shown an incredible amount of patience, and we have not heard you two complain one time about the conditions here, not to mention the workload and tight schedules we impose on you! You certainly refute the image of the “Ugly American” when traveling overseas, and in a mission not for personal gain but for your love for God and your brethren. We are truly blessed to have you as friends, and it will always be an honor for us to have you stay with us whenever you come. Janet and Steve, thank you from the bottom of our hearts. Thanks a million for sharing with the Catholic community your infectious love of Jesus, His word and His Church. I saw you on the Franciscan program with Scott Hahn, Fr. Scanlan and Regis Martin and I couldn’t help remarking what a refreshing breath of fresh air the converts have been to the Church. I have learnt more about Scripture from that group than I learnt in the seminary. You represent a large part of the “springtime” the Pope foretold in one of his talks. Do keep up the very good work! It is my great pleasure to recommend for your reading, viewing, and listening pleasure and edification, any books, videos, and talks by Steve Ray that you are able to access. In my experience, Steve is a wonderfully competent teacher, whose orthodoxy, fidelity to the Magisterium, and personal love of the Lord Jesus are exemplary. You would be well served by taking advantage of his significant teaching gifts. I and the people of the parish I serve have certainly experienced growth in our Christian walk through his educational ministry. I warmly recommend him and his work. Steve Ray is an inspiring and impassioned presenter. Steve has been an annual speaker at St. Andrew for the last several years. His depth of knowledge is impressive and his enthusiasm is contagious. We look forward to having him back to speak and help our Parish truly understand their Faith. Thank you for taking time from your busy schedule to speak at our conference. We are especially grateful to you for changing your own plans to accommodate us. I am sure that parents have greatly benefited from your talks on such an important topic as the papacy. Your research gives us a much deeper understanding of the doctrines of the Church and brings the gospel to life. Your zealous pursuit and documentation of the truth is also a wonderful example for all of us. We certainly need more enthusiastic Catholics such you. Thank you again for helping to make the conference a success and for your support of Catholic home schooling families. What is special about Steve Ray and why would people want to hear him? Several weeks ago, after all the Masses, we showed Steve Ray’s video, Jesus, from his “Footprints of God” series, to introduce him to the parish. We thought people would watch 5-10 minutes and leave. After each Mass we had parishioners stay till the end – an hour and 15 minutes! Many of those had tears in their eyes and asked if we had additional videos that were going to be shown. What makes Steve Ray “special” is that he is a very down-to-earth, relatable guy, who loves being Catholic and wants to share that love with anyone who will listen. Not only is his enthusiasm contagious, but he meets, head-on, some questions and objections others have voiced about the Catholic Church. I’ve been meaning to send you an email just to let you know you’re doing a good job and to keep up the good work. I have been listening to you and have read several of your writings and responses on your website and want to tell you that I think you are doing an awesome job. You seem to put things into words very well and explain things so thorough that even my young 7 year old daughter would understand. Thanks Steve! I am using your Footprints of God videos to teach my Catholic friends about our awesome faith. I’ve also loaned to many your talks at Steubenville and other materials. I heard your talk on Paul in Steubenvill under the tent. I had a friend with me and after he listened to you speak, he has become very enthusiastic about learning more. Keep your enthusiasm!!! It is extremely contagious!!!! May God bless you always! I wanted to send an email to say thank you for coming to our parish yesterday & today in Los Lunas, NM. My wife & I listened with great enjoyment and rapt attention to your lectures. We were sorry that you had to cut your talks down in order to make the flight back home. We requested to Father Rick tonite, after Mass, that the parish consider bringing you back next year so you can stay longer. God Bless you and your family for the great work you are doing. There are speakers and there are speakers — you’re a great one who speaks with faith and heart. Thank you for your work, your faith, your family and your willingness to come to remote places like Los Lunas. I/we hope you would be willing to come back with your family. As I listened to Steve Ray’s conversion story, my Evangelical Christian world started to crumble. After 15 (for my husband 30) years as an Ex-Cathlolic Evangelical, floundering and seaching for ways to get closer to Jesus, I was terrified to think that the Roman Catholic Church might be the home I’d been searching for. The terror did not compare however to the sorrow I felt when I realized that after all those years of praying to get closer to Jesus, all I had to do was go to my local Catholic parish and He was waiting for me all along. Now my husband and I are attempting to tell all of our Ex-Catholic Evangelical friends the truth about Christ’s Church. One of our most important tools is Steve Ray’s conversion story. God bless you and your ministry Steve. You are a gift to the Church! You made a huge impact on the parishioners of San Clemente Parish and on the staff. You are a kind and down to earth individual who exudes the faith. It was a pleasure to have you here in January and we would love to have you and Janet come back and stay for a few days so that we could show you some of the old Catholic sites in New Mexico. Next time the people have asked to have you continue your talk about Peter and the Real Presence of Jesus Human/Divine. We felt blest having you here and know that your work with apologetics and connecting the faith to the world today are bringing many people to the church and back to the “Big Ship”. God bless you in your work. Dear Steve: We are sincerely grateful to you for coming to our parish and for your faith-filled and inspiring talks. God bless you and your family. I’m a fan of your work. I enjoy and appreciate your apologetics. Your enthusiasm is definitely contagious. I have a number of your tapes. My favorite is your 6 tape set on the Sacraments. I love how you use the story (of the tightrope walker who asked for volunteers as he walked across the Niagara Falls) to explain what it means to BELIEVE. I used that in one of my Sunday homilies and weekly bulletin columns. You are a positive ambassador for the Church and its teachings. I heard you speak in Raleigh NC a few weeks ago – lots of fun! I’ve been enjoying your tapes and CD’s so much. Just want you to know that your talks have really helped to strengthen my faith in the Catholic Church. Keep up the great work! Mr. Ray, I just wanted to tell you how much I enjoy your presentations. If you have some time, I want to share with you a little story: The very first time that I heard you was at the 1st Fullness of Truth conference in Houtson, I believe it was 2001. I tell you brother, you inspired me so much when I heard you. I had already began to study apologetics a little bit at that time, via Tim Staples. But man, your authenticity, your passion, and your zeal set me on fire. My heart was pounding as you were speaking, with a “burning in the bosom.” All I could think about was how one day I want to share the Gospel as he is doing! Thank you for fanning the flame of Christ within my soul. Thank you for all that you do for the Lord. Thank you, again, Steve for gracing us with your presence and your talk at our conference. It was wonderful having you there. It was such a great weekend –we’re getting such wonderful feedback from the participants and everyone adored you! You were wonderful, just as I knew you would be. I cannot recommend Steve Rays products enough. I am a cradle Catholic and I have purchased many of his DVD’s, books and tapes. He presents the Catholic faith in a very heartfelt, down-to-earth, but also solid and knowledgeable way. I find his DVD’s, books and tapes to be entertaining, fun, and very enlightening. Thanks so much for your books and web-site. They have helped me immensely on my Journey. As a “Revert” to the faith, you have made me realize just how true our faith really is. I can’t thank you enough. Also, thank you for the wonderful talk you gave at the “Defending the Faith” Conference at Stuebenville. It was so inspirational. I just want to let you know how wonderful it was to hear you speak and spread the word and works of God! I needed the match for the fire and you both were there to strike the match and produce the fire!!!! What a wonderful impact you have made on our lives in just a couple short weeks. My wife and some friends saw him at Our Lady of the Lake in Chapin , SC a couple weeks ago. I was unable to attend and now deeply regret it. The day ended way too soon for them. We bought many CD’s (which Steve graciously signed) and we have been listening to them every chance we get. I am a cradle Catholic and never knew how (or had to) justify our Catholic Faith until moving to SC. I can’t tell you how much we needed to hear Steve’s stories and now we try to spend time every evening looking up scriptures in the Bible and reading them in their entirety to get their full meaning. Steve’s talks have given me the focus to learn how to speak of our faith in a community dominated by our Protestant friends. We not only ordered more CD’s, but also the full DVD series to watch with our little girls to help educate them on the Truth behind our faith. We thank you for being in the right place and the right time for us. You are truly a blessing for us all! We have been getting some awesome feedback from your talk. Comments such as: He was down to earth. Not preachy. He was helpful. He gave good practical tips. He was humorous. He was encouraging. He was informative, especially for us women. I wish I had heard this long ago! I could have listened to him talk more. One man shared that he felt he was not romantic enough and he needed to work on that. His wife agreed, but also felt that she understood more how “he” felt. She never realized it before. We agreed with all of the great comments, Steve. We are looking forward to a tape of your talk. I believe Steve Ray’s writings, CDs, and DVDs are loaded with good homiletic material. This past Good Friday I combined some of my research on the crucifixion along with some material from Steve’s talk, “The Pain of the Crucifixion.” The positive response from the parishioners was overwhelming. The positive feedback kept coming even months later. I have also used some of Steve’s material for my high school senior religion class. I believe his writing style is very clear, informative, and engaging. It is my prayer that God continues to bless his ministry. I am writing this simply to thank you for all you keep doing to work for Christ through our Catholic faith. Your book, Crossing the Tiber was one of the best works I have ever read, esp. the last two sections. As a priest, I know that sometimes, in ministry, we can become overwhelmed by the negativity around us sown by the Evil One. Please know that your work is important and that you are doing it well. There are many fellow “workers in the vineyard” who appreciate what you and other like you do. Fr. John Raphael Hadnagy, O.F.M. Conv. I am writing to give credit to Steve Ray for his outstanding work in evangelization of the Catholic Church. Our station has had the pleasure of hosting Steve several times in Toledo and he always brings exuberance and joy to his ministry. Through his talks, those in attendance are mesmerized and completely absorbed by his unique style of promoting and teaching apologetics of the Catholic Church. I received many favorable comments after Steve’s talks about his presentation and asking when are we having him back again! Steve is a real blessing to the Church and by his ministry he not only proclaims the Gospel, but lives it! Thanks so much for this truly wonderful website. My story is not unlike Stephen’s in that I’m a Convert from the Baptist church and my brother is a Baptist Minister. I’ve been totally born again but not at all in the Protestant sense. Of course I’m getting all the stuff about “having lost my faith” and not being a Christian any more BUT I take no notice. I know for certain in a way I never knew as a Baptist that Jesus is fully revealed through the Holy Catholic church – despite us all as sinners, I know that true Salvation is only possible through the Catholic church.